The Greek Place was a restaurant here in Cedar Rapids that closed a few years ago. My favorite meal was always the Pastitsio, which I almost made for this month’s Food of the World Greece. Instead I went with a healthier, Chicken ala Grecque which was also quite delicious. I never knew what exact translation of the name was, but I’m pretty sure it means Greek Roasted Chicken. The skin is crispy, and the meat is tender and flavorful! Forget about the rotisserie chicken at the grocery store, this is much better…..
Preheat oven to 400 degrees. 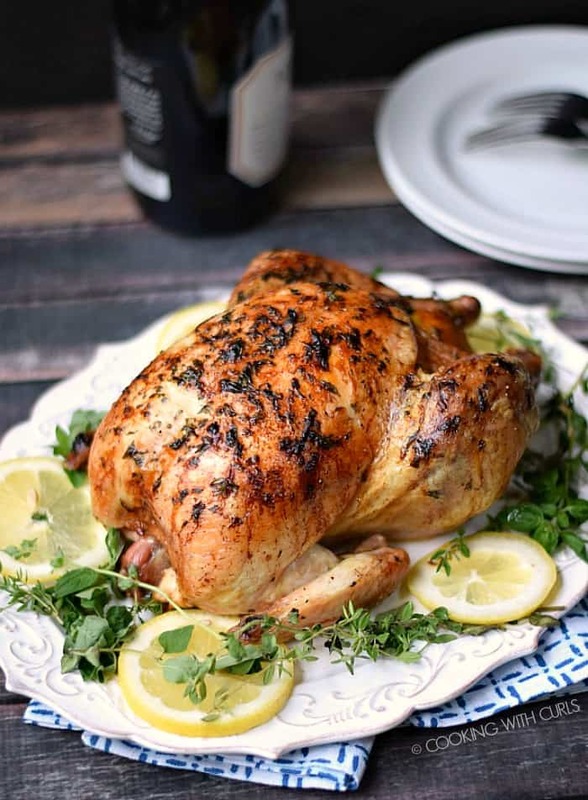 Rub olive oil all over the skin of the chicken, and sprinkle with the herbs, salt and pepper…..
Stuff the cavity of the chicken with half of the garlic cloves, lemon wedges, and onion wedges….. Tie legs together with twine to hold them in place. 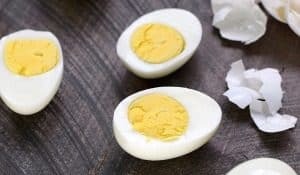 Place remaining garlic, onions, and lemon in the pan surrounding the chicken…..
Place in preheated oven and bake for 1 hour to 1 hour and 15 minutes until golden brown and thermometer reaches 165 degrees….. 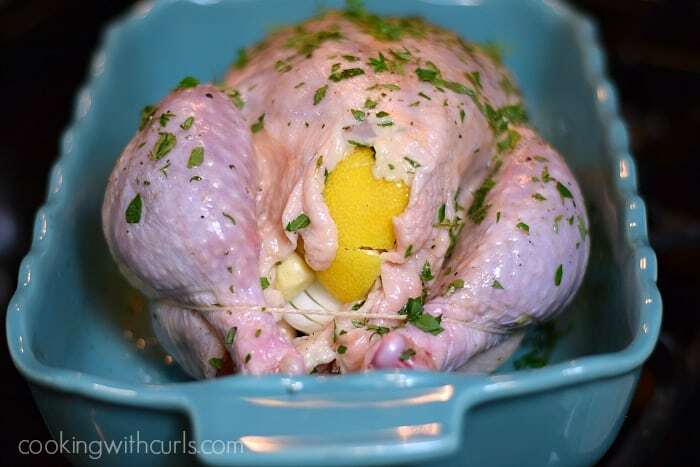 Allow chicken to rest for 10 to 15 minutes before serving. 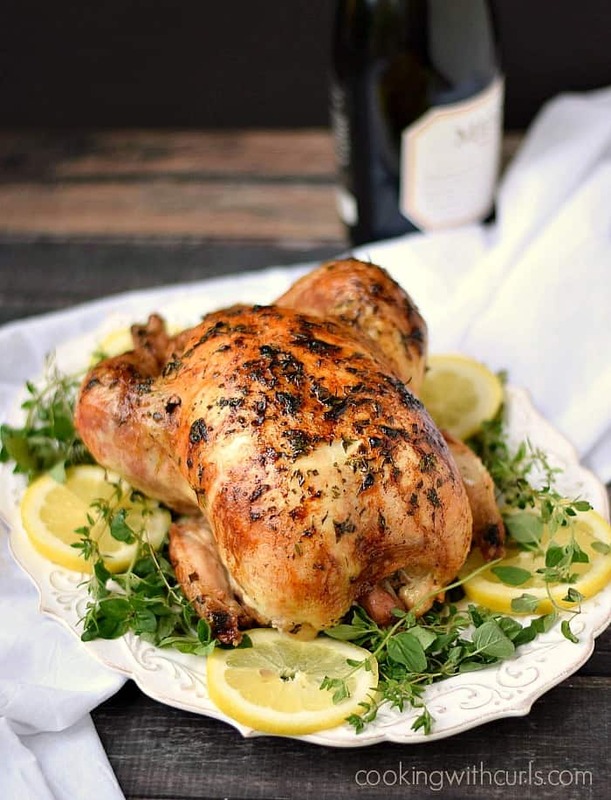 This Greek Roasted Chicken is tender and flavorful on the inside and crispy on the outside! Preheat oven to 400 degrees. 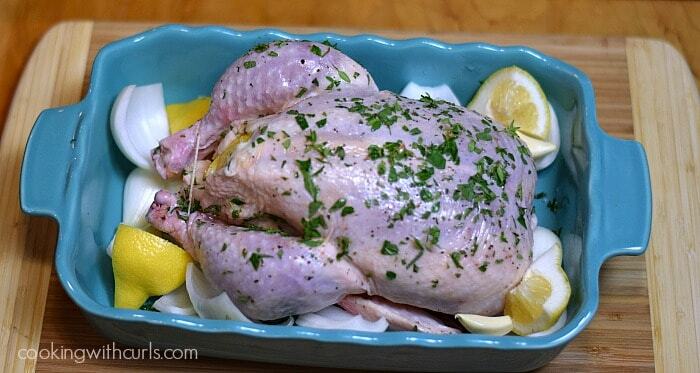 Place chicken in a small roasting pan. Rub olive oil over the top of the chicken, messaging into the skin. Sprinkle with herbs, salt and pepper. Place half of the garlic, onion, and lemon inside the chicken. Tie the legs together with twine to hold everything together. Place remaining garlic, onion, and lemon around the chicken. 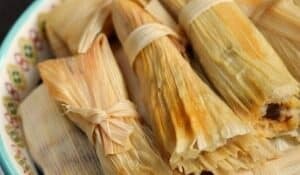 Place in preheated oven and bake for 1 hour to 1 hour and 15 minutes, until thermometer reaches 165 degrees. 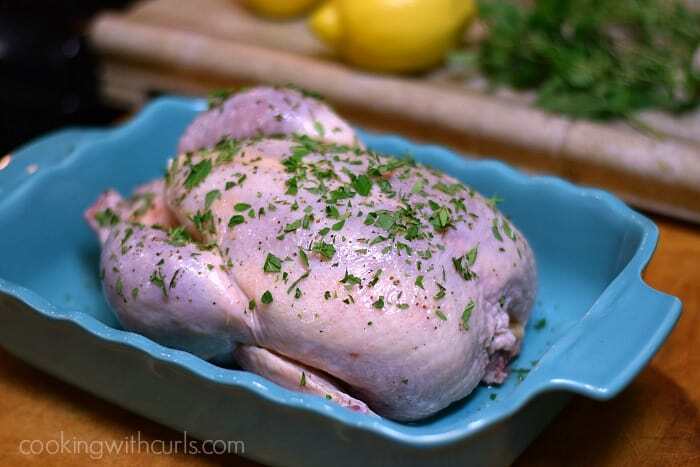 Remove chicken from oven, and allow to rest for 10 to 15 minutes before serving. Substitute a 1/2 teaspoon each of dried herbs if fresh is not available. That is one good looking bird, but how could it not be… it’s Greek. OH that looks so juicy and full of wonderful flavor!! Oh my gosh!! This sounds so moist and flavorful, Lisa! Perfect for Sunday! This is one perfect looking chicken! 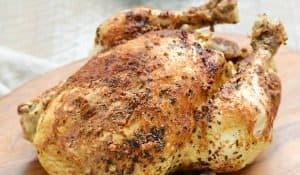 I’ve actually never made a whole chicken before but this makes me want to give it a try! Lisa, this looks fantastic. 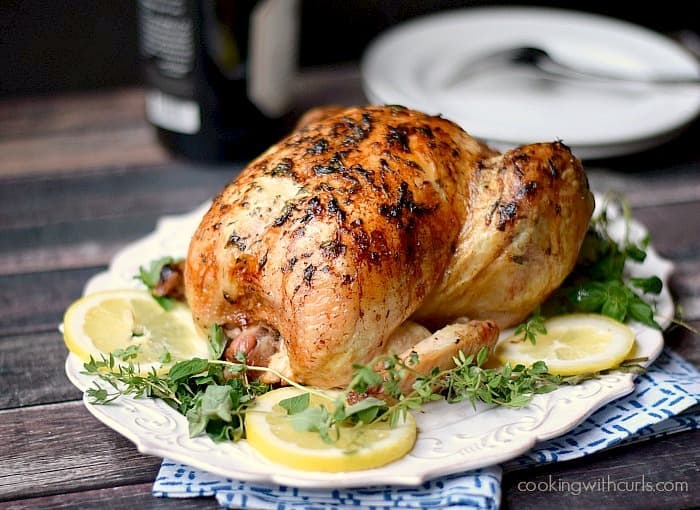 On Sunday nights from about October to March I make a roasted chicken for dinner so I’ll be giving this one a try! Ok, Lisa, one word – amazing! This looks so delicious I wish I could pull it off the screen! 🙂 Pinned and sharing! This chicken look so delicious! 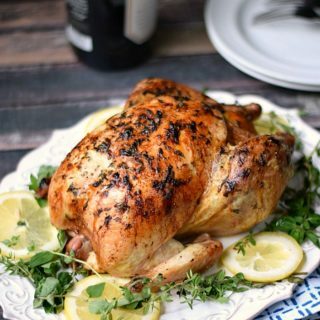 I love Greek chicken because I love chicken with lemon. This looks awesome…thanks for sharing! Greek food is sort of a favorite of mine. This reminds me of home! This looks so flavorful! Wish I could just dig in! That’s one fine looking bird, Lisa! I too love the Pastitsio. I also love the Moussaka. YUM YUM YUM. Great recipe, Lisa. Pinned and sharing on FB this week! This is one awesome looking chicken! I love those Greek flavors. Delicious!